Available free for your troop. The template is available without charge and is available in plain HTML or as a WordPress theme. Download now and start building your troop's website. The Scout Troop template and Scout Troop WordPress theme are marked up in valid HTML 5 and CSS 3, but should downgrade well on IE 8. The template is responsive (renders well on large screens and smartphones). It is also designed with web accessibility standards in mind. Someone in the CrossTimbers District asked someone in a Boy Scout troop in Arlington, Texas for a Troop Website Template. After this was done the request for a WordPress template for Boy Scout Troops was made. The result is the ScoutTroop WordPress theme. The theme/template is free. It was provided at the request of a B.S.A. unit and is a completely free Boy Scout Troop WordPress theme and HTML Template. If you want to be supportive, buy some popcorn from a Boy Scout. If you downloaded the WordPress Theme prior to April 26, 2014 and wish to upgrade, you must completely remove the old version and reinstall the theme. New updates will be indicated in the WordPress dashboard. ScoutPack, the new WordPress theme for Cub Scout Packs is now available. 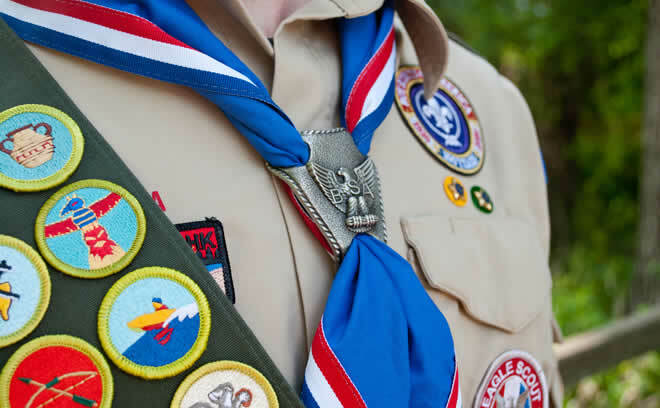 It is very similar to the ScoutTroop theme, but features Cub Scout images and colors. Check it out.